Moravian Book Shop in historic downtown Bethlehem, Pennsylvania. America's oldest book shop will soon be run by America's most familiar bookstore, one known to the outside promenades of malls and giant college campuses across the country. 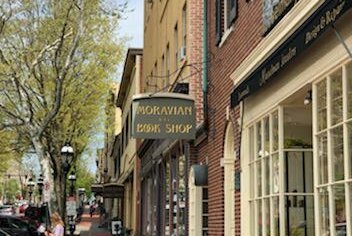 Moravian Book Shop in historic downtown Bethlehem, Pennsylvania, recently was acquired by Moravian College. Moravian Church Northern Province, the previous owner, sold the shop so it could focus on its congregation. This isn't a simple transition of owners. Moravian College plans to let Barnes & Noble, which has bookstores on a whopping 782 campuses across the country, take over operations of the shop, making it Moravian's primary bookstore for students. The swap is expected to take place in June. Two businesses housed within the store will close and, naturally, there will now be more Moravian gear in a shop known mostly for its books, crafts, toys, gifts and Star-themed merchandise. Colony Meadery and Bone Appetit, the brewery and pet food operations in the shop, will be discontinued on the property, [Moravian spokesman Michael Corr] said, and the college will work with Barnes & Noble and the Sodexo food business to decide what will go in those spaces. The book section of the shop will look essentially the same, Corr said. “You’ll probably see more Moravian [College] gear and more Moravian textbooks” for sale, he added. Founded in 1745 and located on Bethlehem's Main Street strip, which is filled with other quaint, independent boutiques, there is concern that flipping the store over to the college and letting Barnes & Noble run will mean sacrificing its unique character. For anyone who's strolled down Main Street (sans the annual teenager invasion during Musikfest), it certainly feels like an odd fit for a Barnes & Noble. Rick Santee, president of the shop's volunteer-appointed board, told LehighValleyLive that Moravian understands the historical value of the shop, adding that this was the most viable way to make sure the business is financially stable. Moravian spokesperson Michael Corr told the website that the college is taking inspiration from William & Mary's bookstore in Virginia, which is also run by Barnes & Noble. Moravian has been coy about what will happen to the current staff, but shop supervisor Leo Atkinson wrote in a Change.org petition that current employees have been told they will have to interview for jobs at the revamped store. The petition, addressed to Moravian President Bryon L. Grigsby, has received more than 6,000 signatures, close to its goal of 7,000. The petition argues that the Bethlehem shop is in a "good position" with its core business, blaming any financial woes on the shop's board and its decision to open another location in nearby Allentown three years ago. In response to the petition, Corr said the shop won't be a Barnes & Noble store, the shop will retain its name and that the college will have final say in any layout or design changes. He said they just need the chain's retail expertise to help run the shop.